Building a solidarity economy in Jackson, Mississippi, anchored by a network of cooperatives and worker-owned, democratically self-managed enterprises. Michael D. Yates, economist, labor educator, and associate editor of the socialist magazine Monthly Review, discusses his new book, Can the Working Class Change the World?, on WRFG Labor Forum on March 11, 2019. In this interview Yates discusses aspects of our vision and our efforts to build worker cooperatives as instruments of working class power and self-organization. In this speech, Professor Robin D. G. Kelley, explains Dr. Martin Luther King’s radical vision, the program of the Mississippi Freedom Democratic Party, the Spirit of 1968, the aims and objectives of the Provisional Government of the Republic of New Afrika, and the continuation of these visions and objectives in the Jackson-Kush Plan and its aims and objectives. This lecture was given in Williamstown, MS on November 15, 2018. It was released on Alternative Radio by David Barsamian on March 25, 2019. Jacobin Magazine interviews Cooperation Jackson leader Kali Akuno on the Green New Deal, the need for mass civil disobedience, and the necessity of building an internationalist movement for eco-socialism. Cooperation Jackson Executive Director, Kali Akuno, speaks with Jonathan Gordon-Farleigh, with the UK based organization, Stir to Action, about Cooperation Jackson, the Jackson-Kush Plan, and the struggle to build solidarity economy and economic democracy in Jackson, Mississippi. 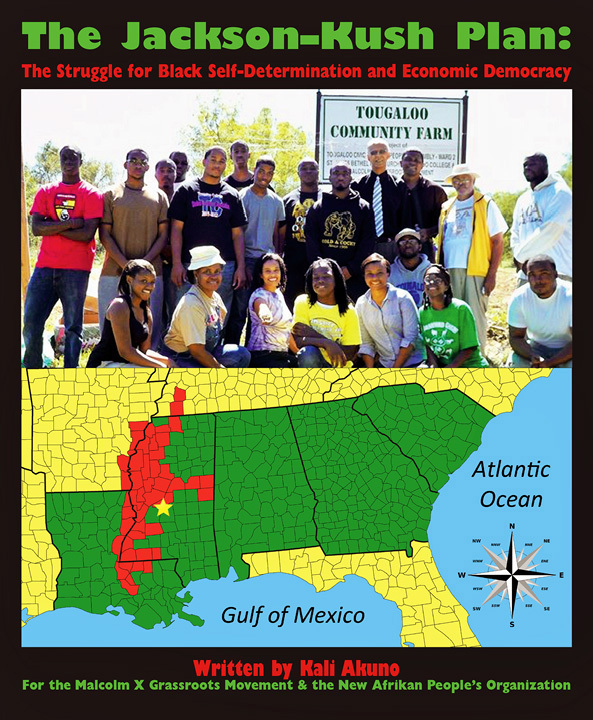 The broad mission of Cooperation Jackson is to advance the development of economic democracy in Jackson, Mississippi, by building a solidarity economy anchored by a network of cooperatives and other types of worker owned and democratically self-managed enterprises. First and foremost, we would like to thank everyone who supported our end of the year fundraising drive. Our objective was to raise $300,000 to support our two main interconnected projects for 2019: a) expanding our Community Land Trust (CLT) with the purchase and first stage development of the Ida B. Wells Plaza and b) initiating the development of our Ewing Street Eco-Village Pilot Project, which entails regenerating the land with a permaculture based landscaping redesign and the installation of our first digitally fabricated housing and communal facilities. Thanks to the generosity of hundreds of supporters, we were able to raise over $270,000 during the end of the year fundraising drive. This was a major success in our view, as it enables us to advance the first critical phase of our drive to Hold the Fortification Line and play a critical role in the bottom up redevelopment of West Jackson. To be more specific, we are now completing the process of purchasing the plaza and will be kickstarting our landscaping operations on the Ewing Street Eco-Village Pilot Project in March. Turning the Grocery unit of the plaza into a multipurpose space that will house a) a hydroponic and aquaponic growing operation, b) a cafe and catering operation, c) a venue to host local artisans and d) a venue to host weekly and/or monthly farmers markets and swap meets. Installing the first digitally fabricated structures on Ewing Street and renovating the 2 existing structures on the block currently in our CLT holdings to make them fully inhabitable. In order to execute the second phase of this plan, we are going to have to raise an estimated $500,000. We plan on doing this through an ongoing fundraising drive to elicit as many personal donations as possible to raise this amount. But, we are also opening ourselves up to take in personal investments and our first loans to meet this challenge. We welcome the challenge and plan on wasting no time in taking it on. To this end, we are commencing our solicitation drive now to start raising the necessary funds. We encourage everyone who supports the development of the commons, community-centered development, regenerative production and economic democracy to join us in this effort. Please give as generously as you can and encourage your family, friends, colleagues, comrades and fellow cooperators to do the same. You can make a tax deductible donation online at https://cooperationjackson.org/donate/. You can also donate via check or money order made out to Cooperation Jackson and mail it to Cooperation Jackson at P.O. Box 1932, Jackson, MS 39215. We also encourage everyone to monitor our progress and hold us accountable by joining our mailing list to receive monthly updates and ask us questions. You can also follow our progress on Facebook at https://www.facebook.com/CooperationJackson or on Twitter at @CooperationJXN. This is a info graphic from the open Building Institute that we will be utilizing as the guide for our the housing units that are going to be constructed by our community production cooperative as part of our ewing street eco-village pilot project. Cooperation Jackson is the realization of a vision decades in the making. Our roots lay deep within the struggle for democratic rights, economic justice, and self-determination, particularly for Afrikan people in the Deep South, and for dignity and equality for all workers. Cooperation Jackson is working towards the goal of creating a new type of eco village that has emerged from a perspective that looks at Land, Housing, and the Economy in an interconnected way. In the effort to create a new eco village model we have partnered with the Spitzer School of Architecture from the City University of New York to explore the utilization of modular urban housing that is socially sustainable and ecologically responsible on our Ewing Street Eco Village Pilot Project. Per our request students from the Spitzer School have explored various modular housing designs in discussion and collaboration with our Community Production Cooperative. Students from the Spitzer School will be joining us on Monday, April 22nd and Tuesday, April 23rd to directly explore our Ewing Street community land trust plots and to present their work for review and discussion with our staff, members, and the West Jackson community at large. Join us Monday, April 22nd and Tuesday, April 23rd at 6 pm to review and discuss the design work of the Spitzer Architecture students. The presentations will be at our Balagoon Center located at 939 W. Capitol Street, Jackson, MS 39203. Snacks and Drinks will be served. If there are any questions please contact us at cooperationjackson@gmail.com or call 601.355.7224. What is the cooperative movement’s vision for our economy? How can we reclaim land and homes from market speculation? Can that reclaimed land form the basis of a new economy beyond capitalism, one based on our human and ecological needs? Cooperation Jackson is proud to announce that we will hosting our first Seven Days Community Art Festival Thursday, April 11th through Thursday, April 18th. The Community Arts Festival is being held in preparation and observation of our five year anniversary, which is May Day (May 1st) 2019. We will be hosting our 5 year anniversary celebrations between Friday, May 3rd through Sunday, May 5th. Please stay tuned for future announcements regarding those plans. The primary objective of the Community Arts Festival is to beautify the commercial and residential property holdings of our community land trust, the Fannie Lou Hamer Community Land Trust, for the purpose of revitalizing our community from the ground up. The secondary purpose is to help us combat gentrification and displacement in West Jackson by creating an environment that reflects and upholds the collective history, aspirations, and struggles of the Black working class that constitute its majority. Cooperation Jackson has 13 Core Principles, which were crafted by adapting aspects from the basic principles of the Mondragón Cooperative Corporation in the Basque country of Spain, and the International Cooperative Alliance’s cooperative identity, values and principles.